Everything your organisation needs to ensure time-efficient, streamlined workflow and smooth movement along the patient pathway. 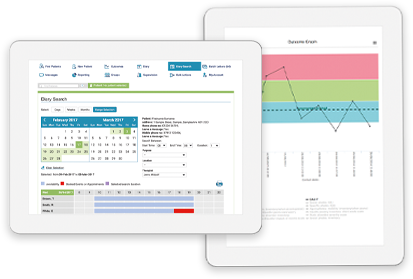 iaptus is a user friendly, cloud based and completely customisable patient management system built to support psychological therapy services delivered by the NHS, charities, third sector providers and in private practice. The system can be tailored to your organisation’s particular way of working – from care pathways to digital referral routes, to helping your organisation meet its particular targets. We believe in interoperability. We work to emerging industry standards and actively seek out opportunities to integrate with other systems. Safe, effective, high quality care depends on it. We work alongside our customers to continually develop the product and its features to meet your changing needs, ensuring the patient journey is seamless and that key data can be recorded and reported against efficiently. iaptus streamlines day to day administrative tasks that take time away from the important work clinicians are here to do, enabling them to spend more time focussed on their patients. Discover how you can increase your organisation’s efficiency, reduce time spent on administrative tasks and improve the patient experience. Our friendly and dedicated team of experts is always on hand for your organisation, providing support and training for your team.